Attaches to either your pistol or rifle! This is an excellent flashlight to mount to your tactical paintball rifle or pistol. It comes with a mount to attach it to a rail on your gun; simply slide it on and give the bolt a slight turn with an alan wrench - installs in seconds! This flashlight is extremely lightweight and has a very compact design; it fits nicely under the barrel of even smaller .43 caliber pistols or anywhere on your paintball rifle. Blind your opponent with this super bright flashlight; briefly paralyze your enemy like a deer caught in your headlights! It also comes with two 3 volt CR123A lithiu batteries (with a shelf life of nearly ten years!). 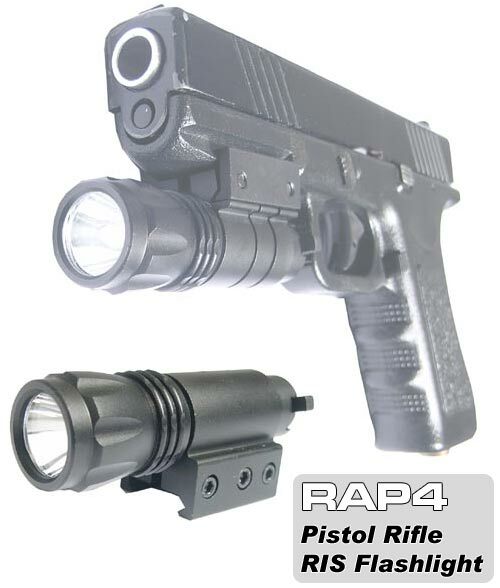 This flashlight is a great upgrade to your pistol or paintball marker of any size! This upgrade is essential if you want to play paintball at night! You must have a rail to mount the flashlight to however, so this accessory is used mostly for tactical play; competition speedball guns generally don't have rails to mount accessories to.